I am looking at a way to somehow send MIDI signals for different chords to Prophet08 (or any synth) by pressing only one button on some device. 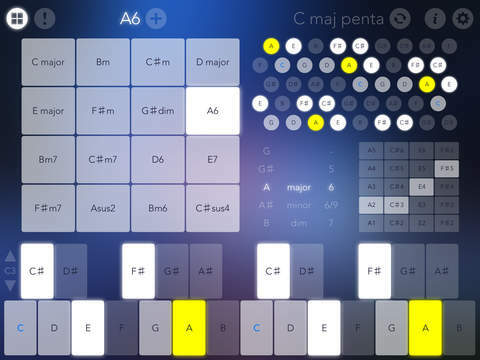 For example, is there an iPhone (iOS) app that can store MIDI chords on pads or keyboard? Possibly that can be done in more complex software but I would like to avoid using a laptop for this, rather looking at something minimal space-wise such as iPhone or iPad. Will shortscale save the day once more? Cool. Does the USB plug into the iPad then (I know nothing about iPad)? Hmm, I found an article that says Android 4 with an OTG cable supports USB MIDI. Trying to get my Archos Titanium tablet (4.1) to use OTG has been unsatisfying, but the article says specifically that the Samsung Galaxy Tab (my wife's tablet) does so.